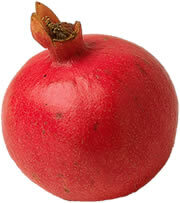 The Pomegranate Fruit is included among a novel category of exotic plant sources called Superfruits. The term "superfruit" refers to a fruit having exceptional nutrient richness and antioxidant quality with appealing taste. Pomegranate is high in three different types of polyphenols, a potent form of antioxidants. The three types - ellagic acid, tannins and anthocyanins - are present in many fruits, but pomegranate powder contains particularly high amounts of all three. 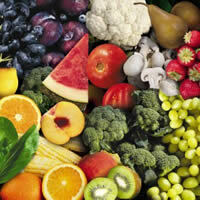 It is also high in vitamin C and potassium and is a good source of the B vitamin pantothenic acid. It is also a good source of fiber and low in calories. The most abundant polyphenols in pomegranate juice are the tannins called punicalagins shown in 39 research publications over the years 1990-2007 to have potent free-radical scavenging ability in laboratory studies. Antioxidant punicalagins absorb into the human body after consumption of pomegranate extracts and studies of human plasma after consumption of a pomegranate extract powder indicated an average 32% increase in plasma antioxidant capacity. Our Pomegranate Juice powder is made from the juice of the pomegranate arils (the fleshy blood-red seed casings) which are the source of much of the nutrients in the fruit and responsible for many of the significant health benefits. Pomegranate is mostly known for its rich content of antioxidants such as soluble polyphenols, tannins,and anthocyanins, which scavenge free radicals. Preliminary evidence suggests that pomegranate is very heart healthy and may reduce cholesterol, reduce blood pressure, slow down LDL cholesterol oxidation and increase blood flow to the heart. According to master herbalist and certified nutritionist Donald Yance in his book Herbal Medicine, Healing & Cancer, ellagic acid "inhibits cancer formation and is believed to inhibit cancer mutation by latching onto DNA-masking sensitive sites on the genetic material that might otherwise be occupied by harmful chemicals.